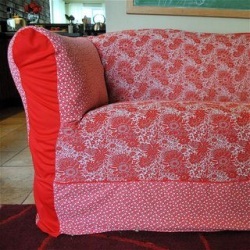 Lookie what she made: Vintage polyester couch cover! Lookie what Ginger from Wiener Dog Tricks made! A champion of the much-maligned vintage polyester fabrics, she has covered her couch with them! Brilliant! Read more about her project at Wiener Dog Tricks.